Time and time again, we bring you the greatest new and old strange things. Today, we travel back to the 80's to bring back arguably the most popular movie prop of that decade. We will take a look at the Back To The Future Flux Capacitor Replica . There is absolutely no need to worry about a chain reaction that would unravel the space-time continuum and consequently destroy the very fabric of the universe by getting this gadget as it is only but a very impressive replica. This futuristic-retro device is guaranteed to bring back past memories of a timeless classic. Re-live your favorite scenes from the Back To The Future movies with this amazing fictional invention. This replica also lights up. You can flip the switch and the LED will light up. Do not worry, plutonium is not required to power this baby up, but you will need 3 "AA" batteries (not included) to light power your LEDs. That being said, except for the time-travel part, it seems to be a fully functioning device! "A Diamond Select Release! Building on the success of our sold-out Flux Capacitor Replica comes the highly anticipated and even more screen-accurate (no strobe light) "Unlimited" Edition! Still measuring in at 16" tall by 11" wide, this working electronic Flux Capacitor features the same attention to detail and sturdy construction as the original, but with an improved, film-accurate lighting design taken directly from the 1985 classic, Back to the Future!" Perfect addition to any delorean! Its about time to add this to your collection! But how much will this gadget set you back? 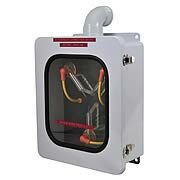 A good Back To The Future Flux Capacitor Replica will set you back around $299.99 and a few years. It is recommended for serious fanatics of the movies and to all you time travellers out there!